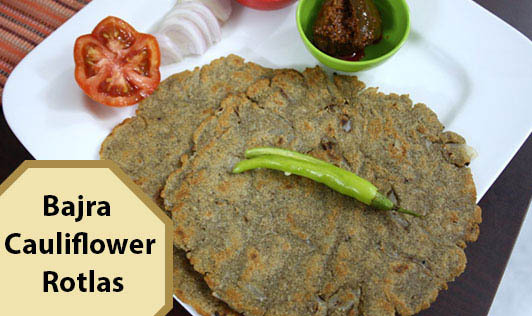 Replace your boring bajra rotlas with delicious bajra cauliflower rotlas. The addition of cauliflower, garlic and spring onions make these rotlas flavorful and delicious. • Knead it using little warm water. • Make 6 equal portions of the dough. • Roll out 6 (4") diameter rotlas. • Place a rotla on a non-stick tawa and cook for few seconds. • Turn it over and cook on other side for a few seconds. • Now remove the rotla from the tawa with a pair of tongs and roast it on an open flame till brown spots appear on both sides. • Do not keep the kneaded dough standing for long and roll out immediately after kneading, as otherwise it turns too soft and becomes difficult to roll. • You can add a little til on top of the rotla to increase calcium.